Symptoms ofÂ AWStMVÂ depend strongly on variety. Some resistant varieties can be infected but show either a very mild mosaic or no symptoms at all. The initial symptoms on susceptible varieties are very thin white to yellow striations or lines on the undersurface of the lower leaves. These distinctive symptoms look more like insect feeding injury than a normal viral mosaic. As leaves age, they may get necrotic brown streaks and start to die. Symptoms on upper leaves usually consist of extremely long, extremely thin green, white, and brown striations that may extend for the entire length of the leaf. 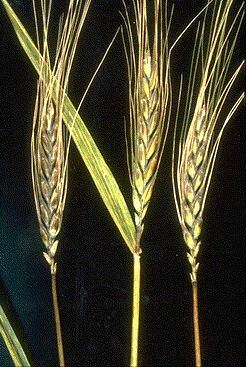 Â When heads emerge, glumes have very striking brown stripes that resemble black chaff symptoms. Unlike black chaff, the glume stripes tend to be very uniform from spikelet to spikelet. Heads do not fill well and often ripen prematurely. Tillers are usually stunted. All the tillers on a plant will be affected, but adjacent plants are often completely free of symptoms. Plants seem to occur randomly in the field with no apparent pattern. Â AWStMV is carried by the painted leafhopper. Wheat, corn, barley, oats, some bromegrasses, and some Panicums are known hosts. Most infections appear to occur in the fall, but symptoms are hard to detect until mid- spring. Early planting probably favors fall infections. We have not observed plant -to-plant spread of the virus. Usually, AWSMV infects less than 1 per cent of the plants in a field. However, in years of heavy infestation by the leafhopper infection rates by AWSMV can exceed 25 per cent. Plants infected as seedlings do not yield grain. The two ways to control AWStMV would be with resistant varieties and by avoiding early planting. Managing diseases and insects can be a frustrating proposition. This Quick Guide can help you identify which disease or insect is damaging your crop.